WATERLOO – Wilfrid Laurier University researchers will have more opportunities to partner with industry and enhance their water research initiatives thanks to a new federal government funding program announced Jan. 14 which will match industry’s contributions to applied water research. Prime Minister Justin Trudeau and Minister of Innovation, Science and Economic Development Navdeep Bains announced a new call for projects in the Advancing Water Technologies (AWT) Program, created and administered by the Southern Ontario Water Consortium (SOWC), of which Laurier is one of nine postsecondary partner institutions. The AWT program supports academic-industry partnerships that improve water and watershed management processes, products or practices and aims to build Ontario’s international reputation for water excellence. Laurier is home to some of the top researchers studying a broad range of water management topics, including the impact of contaminants on aquatic life and the effects of climate change on the availability of water resources, to name a few. 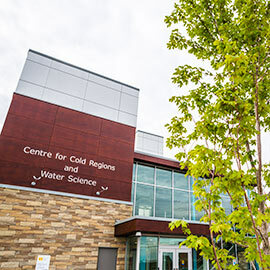 The Laurier Centre for Cold Regions and Water Science, in addition to housing interdisciplinary cold regions water research, chemistry and biology labs and research equipment, houses ecotoxicology equipment, sample preparation and staging areas for mobile trailers for the SOWC. Laurier’s interdisciplinary water researchers are biologists, geographers and chemists who focus on some of the country’s most pressing questions about water, environmental and resource issues, and implications for policy development and resource management. Their research spans water source monitoring and protection in watersheds, industrial wastewater treatment, and addressing drinking water contaminants in rivers, lakes and oceans. Under the umbrella of the new AWT Program, biology professors plan on working with major engineering companies to develop better ways and tools for monitoring watersheds, while chemistry researchers are looking to help local manufacturers improve capabilities of wastewater treatment equipment. Other active and developing Laurier research projects that could be funded by the AWT program are aimed at improving all aspects of water from source to tap. In addition to Laurier’s SOWC partnership, the university’s formal partnership with the Government of the Northwest Territories and research on climate change in the north translates into practical applications and policy influence that is integral to the future of the NWT, the country and the globe, given the fresh water stored in Canada’s north. An AWT information session with Anna Ziolecki, manager of research Partnerships at SOWC, will be held at Laurier Feb. 17 at 10 a.m. Email ostukalov@wlu.ca for further details and to register. The SOWC is a platform for turning water ideas into water innovations through research, development, and demonstration of solutions to water problems faced in Ontario and around the world. The SOWC is supported by the Government of Ontario through the Ministry of Research and Innovation's Ontario Research Fund. The Government of Canada is providing support through the Federal Economic Development Agency for Southern Ontario’s Technology Development Program, which has served as a catalyst for SOWC programs such as the one announced Jan. 14. Laurier is one of nine university partners of the consortium, which also includes municipalities, not-for-profits, and the private sector.